The sense of freedom that comes from riding a motorcycle is something that cannot be beaten or compared, and touring on a bike is a uniquely satisfying experience that every bike lover should experience during their lifetime. On a bike, you are completely surrounded by the beauty of nature and your surroundings, and you just get so much closer to it all than you do when you’re inside a car. And one place where there are a great number of breathtaking roads to ride down is the USA! So we’ve pulled together our top ten routes you need to experience for yourself. This famous road is one of the most exhilarating rides on our list, with 318 tight corners in 11 miles. This road spans Deal’s Gap, which is at the border of North Carolina and Tennessee. It is best taken with care but is a favourite amongst enthusiasts of both bikes and sports cars, and the good news is that there are no intersecting roads to deal with! It is illegal for trucks over 30 feet long to drive on the Tail of the Dragon, but some do end up down there if they get lost, or simply decide to use it as a shortcut, so be prepared. You can find some tips on how to enjoy riding the Dragon safely here. This one was recommended to us by the guys at WeWantYourMotorbike.com, who definitely know a thing or two about biking. This particular route is rather remote, and you can actually only access it in the summer months! An epic 50-mile mountain road full of twists and turns, this route passes Glacier National Park and climbs from Lake McDonald to the summit at Logan Pass, which sits at 6,646 feet. If you want to take in some breathtaking views, plan in a stop at Jackson Glacier Overlook, and bring a pair of binoculars to help you spot the bighorn sheep and mountain goats that live there. You can find out more info to help you plan your trip on the National Park Services website here. This road will take you for a ride through history, as it roughly follows the Old Natchez Trace travel corridor which was used by American Indians, and before that as a migratory trail for buffalo. Since being built as a road in the 1930s, people have enjoyed riding the road itself, as well as taking in the history. Bikers will be pleased to hear that there are no trucks allowed on the road, and there are also no stop signs! This section of Highway 170 runs between Candelaria and Presidio in Texas and gets its name of the River Road because it follows the Rio Grande through the desert. This route is not as famous as some of the roads on our list, but it is well worth a ride, and there are a number of attractions along the way that are worth paying a visit to such as Closed Canyon, the Contrabando Movie Set, and the ghost town of Terlingua. We wouldn’t advise tackling this route during the height of summer as temperatures soar, but it’s definitely one to add to your bucket list. For an idea of what you can expect, we love this write up on Take My Trip, which includes a drivelapse video! For a beautiful seaside ride, you can’t go far wrong with this section of Route 1 in Maine which runs from Brunswick to Machias and passes through quaint seaside villages and past many lobster shacks where you can stop to grab a bite to eat. This route is for those who would like to take in the scenery at a leisurely pace rather than a thrill-seeking ride, but there are definitely still some open sections to be enjoyed at speed. Check out some of the attractions you’ll find along the way in this roundup. This route begins in Panguitch and will take a full day to complete (or ideally two with an overnight stay), as you follow U.S. 89 south to Route 12, and then head east to Torrey, taking in fantastic geological scenery as you ride. There are plenty of canyons, cliffs, buttes and mesas to be seen along this route, and you’ll also pass through the Dixie National Forest, so it’s well worth bringing a camera to capture the incredible views. You can find more information about the route here. This 68 mile stretch of U.S. Highway 212 features dozens of hairpin bends and switchbacks, making for a really great bike ride. It is also often hailed as one of the most scenic drives in the US, boasting views of the Beartooth and Absaroka Mountains, as well as glacial lakes, forested valleys, waterfalls, and plenty of wildlife as it enters Yellowstone National Park. Definitely a great route to try if you fancy a ride on the wild side, you can check out more information here. This iconic route should definitely be on your bucket list if you are a serious motorbike enthusiast. This mountain road runs from Virginia all the way to Cherokee in North Carolina and features beautiful scenery all along the way. The speed limit on this road is 45 MPH, so you’ll be able to savour all the views on offer, and there are sweeping curves to enjoy. This ride is short but sweet, at 60 miles long. There are some fantastic twisties to enjoy, and some equally fantastic scenery courtesy of Mother Nature, from Rocky Mountain vistas to thick forests and alpine meadows which put on a colourful display in the spring. Be sure to keep to a sensible speed while enjoying this route, as there are often moose and elk to be seen, and perhaps pack your hiking boots and make a stop to walk one of the scenic trails along the way. The Pacific Coast Highway is famous for being one of the most scenic drives in the world, and while the entire route is over 655 miles long and so definitely something of an adventure, you could also choose to complete just a section of it. 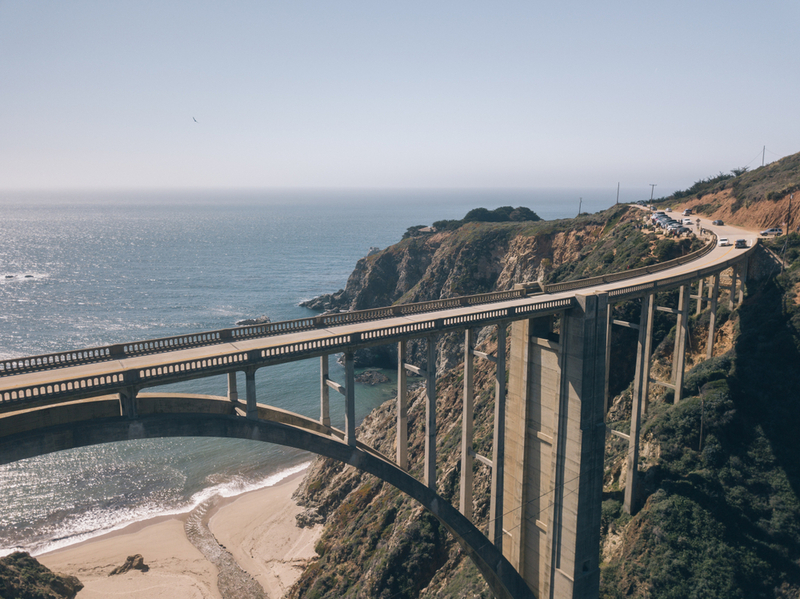 We would recommend checking out the Big Sur section of this coastal road and enjoying the sights along the way such as enormous redwood forests, beaches where you can spot seals, and the famous Bixby Bridge. We hope that this has given you some inspiration if you’ve been contemplating a motorcycle trip to the United States! Be sure to check out our flights offers here at Globehunters if you’re planning your trip soon.